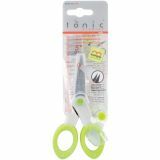 Kushgrip Non-Stick Scissors 5" - TONIC STUDIOS-Kushgrip Non-Stick Scissors. 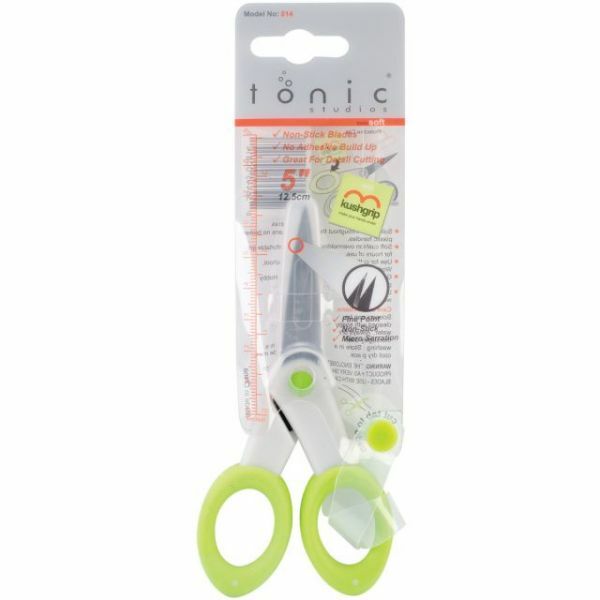 These 5in scissors have one serrated blade and one fine point blade for excellent and detailed cutting on all types of materials. Use at home, office and school, for crafts, scrapbooking and other hobby projects. The solid steel throughout the handles means no broken plastic handles. Soft cushion over-molding gives a comfortable grip for hours of use. Non-stick coating means no build up of adhesive. Scissors come with a sheath for blade protection and safe handling. Scissors measure 5-1/2x2-3/8x1/2in. Imported.